There are six marinas on Lake Powell. Wahweap and Bullfrog have the most public services, including nearby communities offering additional lodging and services. 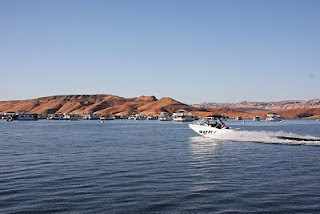 Wahweap, near the Glen Canyon Dam and approximately 6 miles from Page AZ, is Lake Powell's largest marina. This marina provides the following services to the public: ranger station, drinking water, restrooms, restaurant, hotel, boat slips, boat rental and repair pump stations, picnic area, campground, trailers, fishing stations, fish cleaning stations, gift shop, marina grocery store, gas station, 6 lane launching ramps. Bullfrog is next in size and is located about 95 miles up lake from the Glen canyon Dam. Nearest city is Ticaboo (about 15 miles away). Bullfrog provides the following services to the public: drinking water, restrooms, hotel, boat slips, pump stations, picnic area, campground, trailers, fishing stations, fish cleaning stations, gift shop, marina grocery store, gas station, 6 lane launching ramps. Halls Crossing is across the lake from Bullfrog, on the east side of the lake, approximately 95 miles up lake from Glen Canyon Dam. Its public services include: drinking water, restrooms, boat slips, pump stations, picnic area, campground, family units, marina grocery store, gas stations, launching ramps. Hite is located at the upper most part of the lake, 139 miles up lake from Glen Canyon Dam, and is accessible from Utah route 95. The paved launch ramp is closed and there are no on-water services because the lake level is too low. When the lake is at or above 3606 feet, smaller boats can launch on an old road bed. Check the water level before coming. The campground is open (undeveloped) and there is a gas station/convenience store nearby where you can get water and supplies. Dangling Rope is only accessible from the lake, about 40 miles up lake from Glen Canyon Dam. Amenities include: gas station, marina grocery store and restrooms. Antelope Point is the newest marina access to the lake. The services include: launching ramp, houseboat and powerboat rentals, fuel dock and convenience store. All lake in Utah Incuding Utah Lake, Deer Creek Reservoir, Yuba lake, Jordanelle Reservoir, Sand Hollow Reservoir, Willard Bay, Pine View Reservoir, East Canyon Reservoir, Scofield Reservoir, Starvations Reservoir, Strawberry Reservoir, Flaming Gorge, Echo Reservoir, Electric Lake, Huntington Reservoir, Mantua Reservoir, Mona Reservoir, Navajo lake, Gunlock Reservoir, Hyrum Resorvoir, Millsite Reservoir, Otter Creek, Palisades Reservoir,Quail Creek Reservoir, Red Fleet Reservoir, and Rock Port Reservoir. Yacht Rental Dubai Water gives peace and calm to the unrest souls and it is the basic reason that when human beings get fed up from the hectic city life they move towards the oceans and seas to explore something unique and different. Lake Powell is perfect to treat your family a vacation. You can enjoy water-skiing, jet-skiing in the place while spending your day with your family. ATV Trails is also perfect for daddy and son bonding. Lake Powell Boat Rentals.